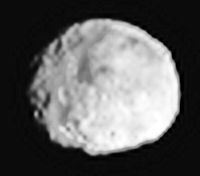 July 6, 2011: NASA's Dawn spacecraft is closing in on Vesta, and from now until the ion-powered spacecraft goes into orbit in mid-July, every picture of the giant asteroid will be the best one ever taken. What will researchers do with this unprecedented clarity? 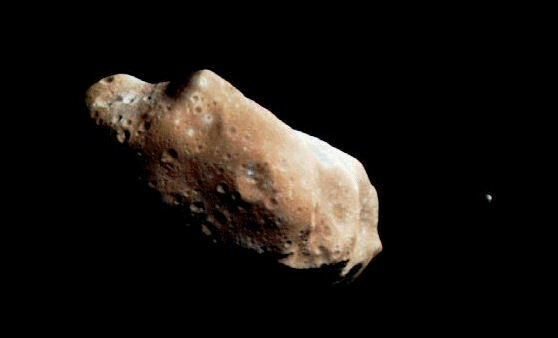 "For starters," says Dawn chief engineer Marc Rayman, "we're going to look for an asteroid moon." You might think of asteroids as isolated bodies tumbling alone through space, but it's entirely possible for these old "loners" to have companions. Indeed, 19-mile-wide Ida, 90-mile-wide Pulcova, 103-mile-wide Kalliope, and 135-mile-wide Eugenia each have a moon. And 175-mile-wide Sylvia has two moons. Measuring 330 miles across, Vesta is much larger than these other examples, so a "Vesta moon" is entirely possible. Hubble and ground based telescopes have looked for Vesta moons before, and seen nothing. Dawn is about to be in position for a closer look. This Saturday, July 9th, just one week before Dawn goes into orbit around Vesta, the moon hunt will commence.2 The cameras will begin taking images of the space surrounding the asteroid, looking for suspicious specks. "If a moon is there, it will appear as a dot that moves around Vesta in successive images as opposed to remaining fixed, like background stars," says Dawn Co-investigator Mark Sykes, who is also director of the Planetary Science Institute. "We'll be able to use short exposures to detect moons as small as 27 meters in diameter. If our longer exposures aren't washed out by the glare of nearby Vesta, we'll be able to detect moons only a few meters in diameter." Besides, Dawn will become a moon itself when it enters orbit around Vesta. And the probe's motions as it circles will provide a lot of information about the rocky relic. Sykes explains: "We'll use the spacecraft's radio signal to measure its motion around Vesta. This will give us a lot of detailed information about the asteroid's gravitational field. We'll learn about Vesta's mass and interior structure, including its core and potential mascons (lumpy concentrations of mass)." As you read this, the spacecraft is gently thrusting closer to its target. And with the navigation images alone we're already watching a never-before-seen world grow ever larger and clearer. "The pictures are beginning to reveal the surface of this battered, alien world," says Rayman. "They're more than enough to tantalize us. We've been in flight for four years, we've been planning the mission for a decade, and people have been looking at Vesta in the night sky for two centuries. Now, finally, we're coming close up to it, and we'll be getting an intimate view of this place." This is not only the first time a spacecraft has visited this alien world, it's also the first time a spacecraft has visited a massive body we haven't approached previously. In the past, rocket ships have orbited Earth, the moon, Mars, Venus, Jupiter, Saturn, and Mercury. "In each case, flyby missions occurred first, providing a good estimate of the target's gravity along with information on other aspects of its physical environment, including whether any moons are present. This time we're much less certain what we'll find." At a recent press conference, NASA Planetary Science Deputy Director Jim Adams told reporters that Dawn will "paint a face on a world seen only as a 'fuzzy blob' up to now." What does Rayman think Vesta's face will look like? "Wrinkled, ancient, wizened, with a tremendous amount of character that bears witness to some fascinating episodes in the solar system's history." (1) In addition to having moons, asteroids can also be double: Binary asteroids sometimes form when a spinning parent body splits. The body is spun up by a phenomenon called YORP that occurs when the body absorbs photons from the sun and reradiates them as heat: more. (2) Dawn will perform dedicated observations in search of moons for about 15 hours. However, if no moon is found at Vesta on July 9th, that doesn't mean there isn't one. Rayman says: "If there is a moon, it might show up by coincidence in other observations, but we have no other observations dedicated in this mission to finding a moon. There is just so much to learn about Vesta itself, that that is where we are focusing our time." (3) From NASA press release: When Vesta captures Dawn into its orbit on July 16, there will be approximately 9,900 miles (16,000 kilometers) between them. When orbit is achieved, they will be approximately 117 million miles (188 million kilometers) away from Earth. During the initial reconnaissance orbit, at approximately 1,700 miles (2,700 kilometers), the spacecraft will get a broad overview of Vesta with color pictures and data in different wavelengths of reflected light. The spacecraft will move into a high-altitude mapping orbit, about 420 miles (680 kilometers) above the surface to systematically map the parts of Vesta's surface illuminated by the sun; collect stereo images to see topographic highs and lows; acquire higher-resolution data to map rock types at the surface; and learn more about Vesta's thermal properties. Dawn then will move even closer, to a low-altitude mapping orbit approximately 120 miles (200 kilometers) above the surface. The primary science goals of this orbit are to detect the byproducts of cosmic rays hitting the surface and help scientists determine the many kinds of atoms there, and probe the protoplanet's internal structure. As Dawn spirals away from Vesta, it will pause again at the high-altitude mapping orbit. Because the sun's angle on the surface will have progressed, scientists will be able to see previously hidden terrain while obtaining different views of surface features. Credits: Dawn's mission to Vesta and Ceres is managed by JPL for NASA's Science Mission Directorate in Washington. Dawn is a project of the directorate's Discovery Program, managed by NASA's Marshall Space Flight Center in Huntsville, Ala. UCLA is responsible for overall Dawn mission science. Orbital Sciences Corp. of Dulles, Va., designed and built the spacecraft. The German Aerospace Center, the Max Planck Institute for Solar System Research, the Italian Space Agency and the Italian National Astrophysical Institute are part of the mission team. JPL is managed for NASA by the California Institute of Technology in Pasadena. For more information about Dawn, visit: http://www.nasa.gov/dawn and http://dawn.jpl.nasa.gov . You can also follow Dawn on Twitter at: http://www.twitter.com/NASA_Dawn .